Astalift is a Japanese skincare brand that's just making its debut in Singapore, and I have to say, the brand is an interesting one. Astalift is actually created by Fujifilm (yes the camera brand). Apparently there are synergies between the technologies for creating film and photography products and beauty ones - who would've thought? Apparently, Fujifilm already does research into collagen and nanotechnology (supposedly one of the main components of film is collagen), and has also been conducting its own work on anti-oxidation (used in anti-aging products of course, but in the Fujifilm context it's used to prevent fading of photos). I got to take a closer look at the brand, and here are some of my thoughts. Astalift has a very strong brand identity - everything is rose scented, and red or red-orange in colour. It's supposed to indicate that the products have Astaxanthin (another branded ingredient that doesn't actually have a name). Astaxanthin is actually a caretenoid-based ingredient that is apparently a powerful antioxidant. So that's why every product is red or orange-red in colour. You'll know what I mean as we look at some of their products. They walked us through their entire product range, but I thought that perhaps to keep this piece focused, I'll just focus on some of the key products in the line. First up, the Astalift Cleansing Oil. Much like DHC and Fancl, this one has a pretty light texture, and, based on a cleaning demo we had (I used it to remove waterproof mascara, below), is pretty effective. 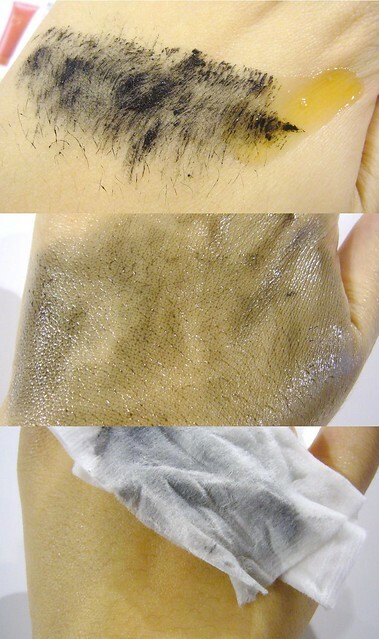 Oil-based cleansers are generally pretty good at cleaning dirt, so this isn't a surprise. The Cleansing Oil also has the red-orange tint the Astalift products have. Next, the cleansing products. Astalift has two, the Liquid Soap (below in the photo), and the Moisture Foam (above in the photo). As you can see, the Moisture Foam is meant gives you a rich, luxurious foam when lathered, and it does. This is pretty much Astalift's version of all those pump-cleansers that dispense as foam (Biore Marshmallow Whip Facial Wash, Amythyststory Mineral Bubble Facial Wash, etc). I guess it caters to an Asian desire to see lots of foam in your facial wash.
Now, the star product of the Astalift line, the Jelly Aquarysta. I gotta say, while I may not care much for gimmicks, this is actually kinda cool. Basially, this product is supposed to be applied straight after cleansing your face. And it's supposed to offer firming and hydration to your skin. 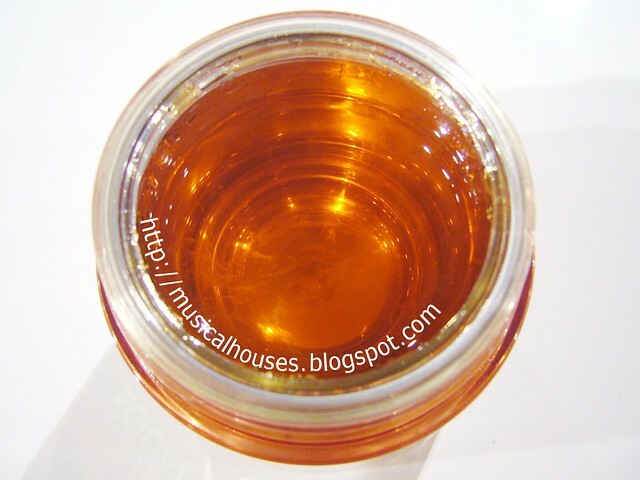 The product itself is a jelly-like gel in that red-orange colour, and offers a cooling sensation upon application. The cool thing about this is that if you mess up the jelly in the jar, it reshapes itself after a few minutes to its original shape. 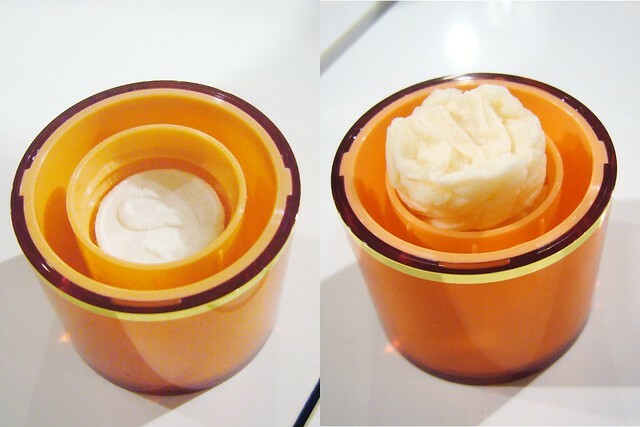 That way, when you open the jar of Jelly Aquarysta, it always looks brand new. While this is cool, I'm not too sure what it actually means for your skin, although its firming powers were supposed to be more potent because of this property. Definitely a product I'd be interested in trying! Also, we have the Astalift Lotion. The thing about Japanese skincare brands is that they tend not to have toners, but instead have lotion products that are basically clear, water-like liquids that are applied onto your face. And instead of sweeping across your face with a cotton pad like a toner, you apply the lotions by pouring a small amount into your palm and massaging into your face. Astalift has two lotions, called Lotion, and Lotion (S). The former is for dryer skin, while the latter is for oilier skin. We were also shown how you can turn your lotions into a mask with the use of a paper mask sheet. Basically, you soak the mask in the Lotion (we used the Astalift Lotion cap as the receptacle, above), and then place it on your face (kindly demonstrated by Minru, below). Lastly, an Asian skincare line wouldn't be complete without a sheet mask - so here you are of course! Astalift's sheet mask is also a red-orange shade, and the cool thing about it is that it comes in two pieces, one for the lower half of your face, and one for the upper half of your face. The mask, along with the Jelly Aquarysta, are supposed to have the highest levels of Astaxanthin, so I think these are worth checking out. 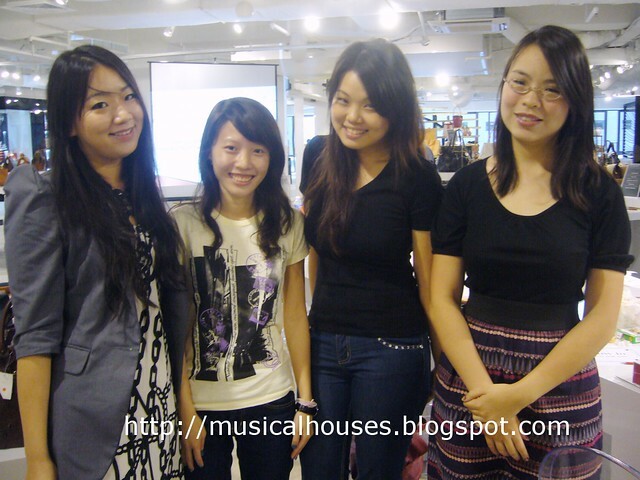 Before I end off, here's a photo of me and other bloggers from the event. All in all, Astalift seems to be a very cohesive lineup of products, with very distinctive branding (the red-orange colour) and some really interesting products. I'm definitely looking out for the Jelly Aquarysta and the Sheet Mask, as I think those are the most interesting products. Hi, very interesting article following a theme. Wondered if you'd be interested in trying Celgenics which I'm sending large quantities to someone in Shanghai. These are energised with homeopathic remedies, flower essences and crystals. The closest thing to what i'm doing is Creme de la Mer but Celgenics is affordable! @marian: Hi Marian, sure I'd be glad to explore this with you! If you'd email me, or use the Contact form on my "Contact" tab, I'd be glad to continue this discusion with you! I've been using astalift products for 7 months. And I'm hooked ... Everyone wants to know what it is I'm doing to look so much younger than My age ... It really foes work!